Unlocking the Dive skill in Sekiro allows you to dive as much as you want, and it’s essential to getting carp scales and previously inaccessible areas. The only problem here is that the Sekiro infinite Dive skill comes way late in the game, and requires you to kill a specific boss. With that in mind, welcome to our Sekiro How to Unlock Dive to Get Carp Scales & Secret Areas guide, in which we will explain where to find and how to get the skill to dive infinitely. Before we dive in, though, allow me to put up a SPOILER WARNING right here. We’ll be discussing some pretty late-game stuff; if you haven’t at least killed Genichiro, turn back now and come again later. How To Get Infinite Dive Skill in Sekiro? 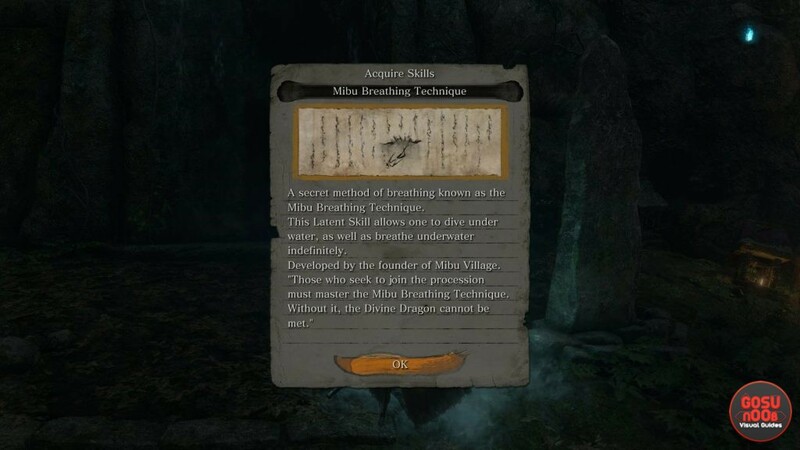 To acquire the skill that unlocks the dive ability in Sekiro, you’ll have to kill the ghostly Corrupted Monk boss in the recesses of Mibu Village. Not to be confused with the other Corrupted Monk you’ve battled earlier on. Basically, as you make your way deeper into Mibu Village, you’ll have to cross a narrow, long, wooden bridge. A spectral samurai will attack you as you go. From there, go up the hill and towards the house where several monsters are trying to come in. If you kill them and eavesdrop at the door, you can get some materials. Go to the left of the house, and you’ll enter the arena where you’ll fight the Corrupted Monk. Make liberal use of firecrackers to stun and open him to attacks. Mortal Draw and Mikiri Counter should work pretty well here, too. In the end, how you dispatch the Corrupted Monk ghost is up to you. When you do slay him, you’ll get a Memory of the battle, and the ability to dive indefinitely. The skill is in the Latent Skill section, and is called Mibu Breathing Technique. Where to Find Sekiro Dive Ability Location? To find the dive skill in Sekiro, you’ll have to reach Mibu Village. This is a part of story progression, but in case you’re having trouble, let’s break it down. We’ll start from the Ashina Reservoir idol. Go down the path from the idol, through the gateway, then turn left at the big fella with the giant hammer. Go up and left, past the guy with a gun and the pot-banger, and jump off the cliff. Quickly turn right and use the grappling hook to get onto the ledge. There, you’ll meet an NPC called Jinzaemon Kumano. Drop into the hole and battle the Longswordmansman boss. Proceed through the narrow hole behind him. From here, the road is pretty linear. Go into the Abandoned Dungeon, drop down into the pit, and kill the Shichimen Warrior boss. Grapple to the ledge behind him, and you’ll come across the Bottomless Hole idol, Jinzaemon once again, and an old lady that will basically tell you to jump into the yawning chasm. So, that’s exactly what you should do. Just have your Grappling Hook at the ready to catch yourself. There’s an idol nearby, so don’t worry if you don’t succeed at first. If you can’t climb up from where you end up, you might have to drop a bit deeper, and catch yourself with the grappling hook again. Scale the cliff, and push forward into Ashina Depths. Kill Snake Eyes Shirahagi, and go through the passageway to the right of the huge statue. Follow the trail of blood, and you’ll come across a headless Guardian Ape. Kill it, and make sure to sever its immortality so that it doesn’t keep pestering you. When it’s dead, grapple to the top of the cliff above the idol, and keep climbing until you get out of the cave. From there, you’re pretty much set. I mean, the road from here isn’t gonna be easy; you’ll have to do battle with all kings of monsters and mini-bosses, as well as platform across branches and cliffs and so on. But, as long as you keep pushing forward, you’ll end up in Mibu Village after a while. Good luck. How to Use Sekiro Diving Skill? To use diving in Sekiro, all you have to do is jump into the water, and hit R1 to dive. As I’ve mentioned before, the Mibu Breathing Technique skill is a Latent Skill, meaning that it doesn’t require you to turn it on. This skill is going to be vital to harvesting Treasure Carp Scales. For more on those, head over to our Sekiro Treasure Carp Scale Locations guide. These are a currency that the merchant Pot Noble Harunaga. From him, you can buy a lot of fun stuff, including Mask Fragments and other goodies.